into something rich and strange... "
"This isn't a social occasion"
"and I meant every word of it"
Like a shadow in sunlight its leaves. Like a promise dying in a hesitant cough. Like the dance that ends in the night. Like the rain on the porch in the dawn. The trees knew that autun'd gone by. Rhyming with words he could not hear. Before everything sunlight betrayed us. Everything's mist when you're far out at sea. It's a dream when you think you're asleep. It's tomorrow when today is only a pramble. It's memory when you're not in your life. I heard him sing and I knew I was alive. And Yet I was lost in the words once again. 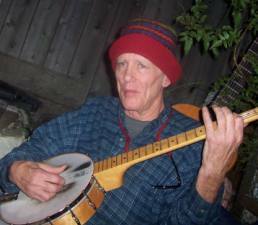 San Francisco native, Dan Harrington was a musician and music was his life. In the early 70's, Dan had studied with Nanos Valoritos* at S.F. State and was a student of literature especially modern French and Spanish literature and film. Dan's lifelong interest in those subjects made him an interesting and eccentric conversationalist, often making obscure references or comments about esoteric literature of all kinds. During those years, Dan could also often be found with his good friends, Jerry Ferraz, Tony Vaughan, and Ted Arvidson. They enjoyed going to poetry readings, writing songs and playing their music at cafes around town. When Dan retired from thirty years as a dock clerk, he had even more time for his music. He was already an expert guitarist and banjo player but when he would see an instrument that interested him, he would get it and begin to teach himself how to play it. He enjoyed sitting outside the Cafe Trieste and playing one or more of the instruments from his collection. Sometimes he would join in playing with others. On occasion Dan could be coaxed to come out and sing his songs at the Bird and Beckett, which was always much appreciated by his fans, but he flat-out refused to feature or in any way bring any attention to himself. Dan also loved the outdoors and before the State Parks closed he often went camping by himself. According to Jerry, he was a secret Zen adept, which few of his friends even knew about and sought solitude hence his frequent get a ways to commune with nature. Dan Harrington was a quiet courteous man in this world but not of it. He died Dec.2012, a month after being diagnosed with Pancreatic Cancer and left the world as unobtrusively as he had lived in it. His music and his manner are very much missed by his friends. Dan Harrington lived in North Beach San Francisco.